Healt­hy and ener­ge­tic employees are a key fac­tor for a company’s suc­cess. Klasmann-Deilmann imple­ments an active health manage­ment poli­cy to pro­mo­te the well­being of its staff. Whe­ther regu­lar health check-ups, free flu jabs or con­tri­bu­ting to the employee’s gym fees, Klasmann-Deilmann does a gre­at deal for its work­force. 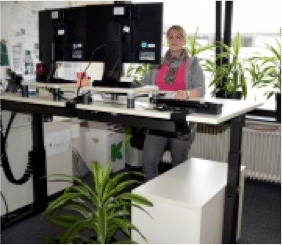 “The aim of our health manage­ment poli­cy is to main­tain, impro­ve or res­to­re the health and well­being of our employees,” says Bene­dikt Kossen (Human Resour­ces). Health manage­ment is the­re­fo­re inte­gra­ted into all ope­ra­ting pro­ces­ses. A health com­mit­tee made up of exe­cu­ti­ves, works coun­cil mem­bers and the com­pa­ny medi­cal offi­cer holds regu­lar mee­tings to dis­cuss the cur­rent and future mea­su­res aimed at pro­mo­ting staff health. Espe­ci­al­ly in this age of demo­gra­phic chan­ge, an active health manage­ment poli­cy plays an increa­singly important role. Employees now have to work until they are older and the average employee age is the­re­fo­re rising, thus put­ting the focus more and more on staff health. “We wish to sup­port this pro­cess as far as pos­si­ble by offe­ring attrac­tive con­di­ti­ons such as fle­xi­ble working hours, pro­vi­ding the right working tools and equip­ment and, above all, by pro­mo­ting staff health,” exp­lains Bene­dikt Kossen. Hea­vy phy­si­cal work is alrea­dy the excep­ti­on at Klasmann-Deilmann: most of the work pro­ces­ses in the indus­tri­al sec­tor are mean­while mecha­nis­ed and the equip­ment at office work­pla­ces has alrea­dy reached a high level at all cor­po­ra­te loca­ti­ons. The watch­word here is ergo­no­mics. But whe­re­as the phy­si­cal effort requi­red of the employees is con­ti­nu­al­ly decli­ning, the psy­cho­so­ci­al stress is on the increa­se, just as it is ever­y­whe­re in socie­ty. “This is a prio­ri­ty sub­ject that is one of the top items on the agen­da of our pre­ven­ti­on poli­ci­es,” reports Wolf­gang Otto, Chair­man of the Gene­ral Works Coun­cil. Active health manage­ment is just one of a num­ber of mea­su­res imple­men­ted by Klasmann-Deilmann to enhan­ce its employ­er bran­ding.